This is my third time at C2E2, but its my first time being able to go more than one day. I went all three days, and I still don't think I saw everything. The con tripled in size this year, I swear. As always, there was a ton of great cosplay there. I thought that Spiderman with the web backpack was genius. We saw the Jay and Silent Bob cosplay on our way to go see Kevin Smith. They had a beer in each hand, which I thought was very fitting. The two female versions of the Doctor were the best I saw all con, of any regeneration. Mech Darth Maul was so impressive, but I don't think he had any time to actually enjoy the con. People were taking pictures of him every time I saw him. That Jack Skellington made the 10 year old in me very happy. So tall! I came home with a ton stuff that I'm going to be giving away at our library this Saturday for Free Comic Book Day. I got to talk to Felicia Day. I can't describe how excited I was, I'm sure I was babbling awkwardly the whole time. I remember saying something about World of Warcraft... Felicia Day is SUCH an inspiration for me. I remember when I learned how much work she had done for the Guild. I was blown away. This picture was on her third day of signing autographs, but she was still so nice. She made time to take to each and every person she signed for. It was crazy. ... Kevin Smith! I've mentioned before that I'm a huge fan, and he didn't disappoint Saturday night. He was hilarious. Told us a story about how he had saved his dog from being eaten by an owl with a pool toy... okay, didn't sound as funny when I wrote it. But I promise, it was great. I haven't laughed so hard in a while. 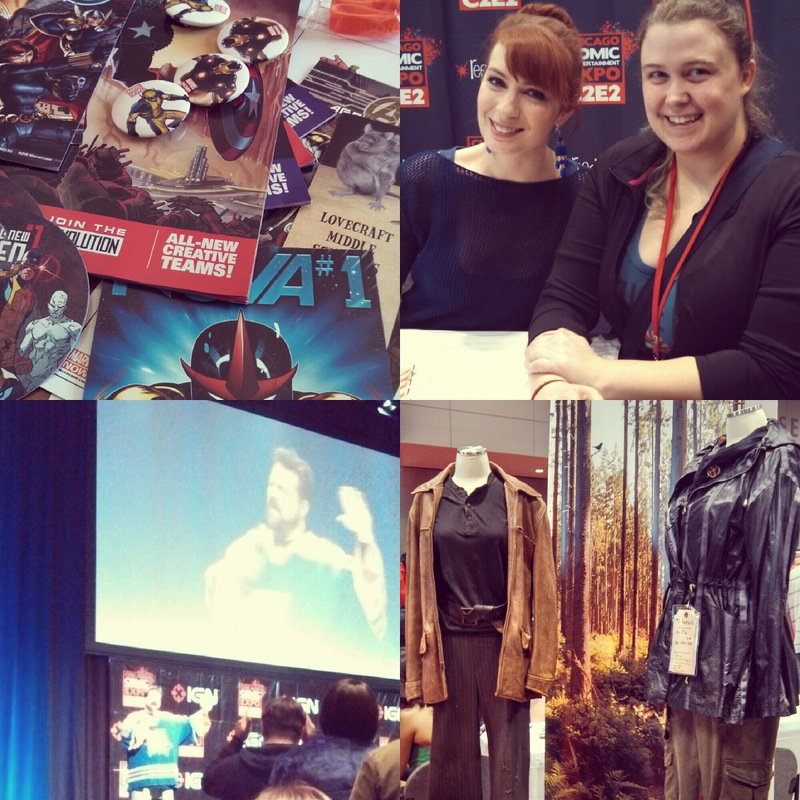 There were a ton of Hunger Game costumes there. The costume designer for that movie got everything spot on. And, as it is with every con, I walked away with a ton of new stuff. I bought prints from Carla Wyzgala, Adam Jay (got a free t-shirt with that one), and a print for Felicia Day to sign. Every year I buy three comics from Zenescope and my new sketch book from Blick art supplies. 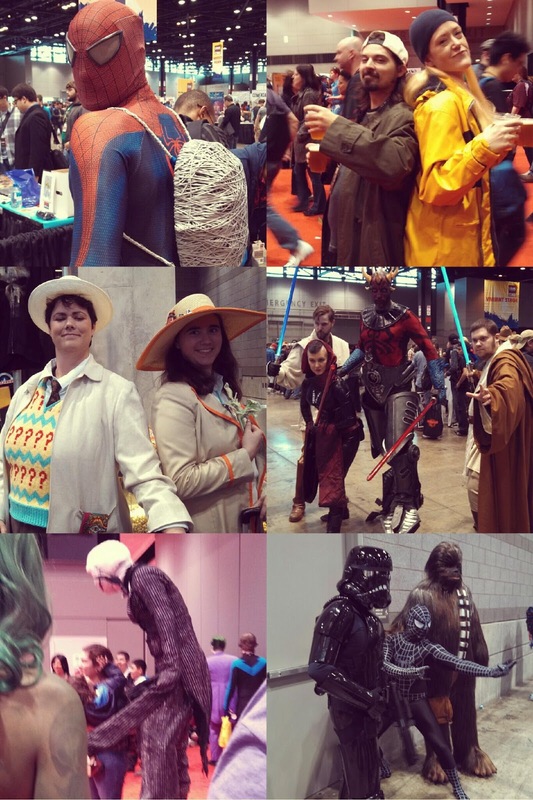 All in all, this year's C2E2 was beyond my wildest expectations. I have to say thank you to my wonderful boyfriend who drove up to Chicago and back TWICE this weekend, listened to my babbling, and still didn't kill me. (Woo!) Can't wait for next year!